Digital history: Images in the Texas Disability History Collection website will include a woman receiving a Bible written in Braille in 1938 and Jim Hayes, founder and longtime coach of the UTA Movin' Mavs wheelchair basketball team, in 1986. The photos are from the Fort Worth Star-Telegram Collection in Special Collections in the Central Library. UT Arlington Libraries have received a $25,000 TexTreasures grant from the Texas State Library and Archives Commission to digitize and publish disability history relating to UTA and Texas, becoming the only such collection in Texas or the Southwest. The digitized items will become part of the Libraries’ Texas Disability History Collection and be made available through a website set to launch in late spring. The disability history collection includes 40 oral history interviews with prominent disability rights advocates and Texans with disabilities, and hundreds of UTA Libraries Special Collections holdings such as personal papers, organizational records, photographs, and audio and video recordings. Read more about the digital disability history collection. 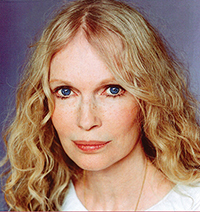 Tickets to see actress and activist Mia Farrow for the Maverick Speakers Series will be available starting Tuesday, Sept. 8. 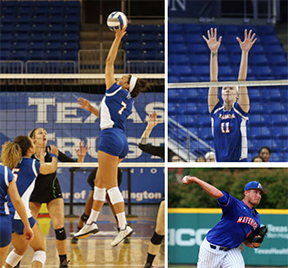 Stay up-to-date with the latest events and innovations at UT Arlington on our official social media channels. Engage with students, alumni, faculty, staff, and the UT Arlington community on Facebook, Twitter, YouTube, Instagram, LinkedIn, Vine, Pinterest, and Snapchat (utarlington). To see a list of some University-hosted social media pages and groups—including Facebook, Twitter, YouTube, LinkedIn, and Flickr—and to learn more about how your department, program, or campus organization can utilize social networking platforms, see UT Arlington’s social media index and social media guidelines. The University Center mall was packed Wednesday for the annual Maverick Cookout Featuring the Activity Fair Day. Students learned about student organizations, sports clubs, social groups, University departments, volunteer opportunities, and community programs. See more photos. The new UTA winterguard will hold auditions Saturday-Sunday, Sept. 12-13, at Texas Hall. Registration starts at 8:30 a.m. Saturday. Auditions are 9 a.m.-6 p.m. Saturday and 10 a.m.-6 p.m. Sunday. Cost to audition is $25. Winterguard is an innovative art form that combines dance, music, art, theater, manipulation of flags, rifles, sabres, and props as well as stamina and great physical fitness. Fine arts credit is available. The group sponsors the Brenham Winterguard and will compete locally, throughout Texas, and at the Winter Guard International World Championships in Dayton, Ohio. For more information, email karen.blake@uta.edu. Whether you're "in-it-to-win-it" or just looking for a muddy good time, Oozeball is a tradition you can't pass up. Competitors take to the sloppy courts for the mud volleyball tournament 1-6:30 p.m. Friday, Sept. 18. The action is at the courts on West Fourth Street at Summit Avenue, south of Greek Row Drive. Texadelphia, home of the original Texas cheesesteak, plans soon to open its latest restaurant in the College Park District. Other food sources in the district are La Blue Casa, Pie Five Pizza, and Coolberry Frozen Yogurt. The Center for African American Studies is accepting applications for the Emerging Scholars Program and the Emerging Leader Initiative. These programs focus on first-year student success and leadership development. Visit uta.edu/caas for details. The deadline to apply is Friday, Sept. 11. Dr. Paul Wong, top left, dean of the College of Liberal Arts, mingles with students at the college's open house Friday. 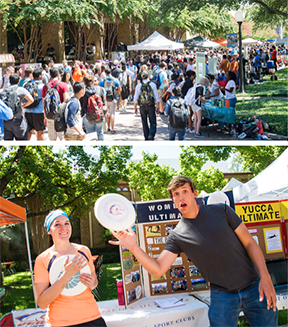 The event was one of several social activities hosted by colleges, schools, departments, and organizations to kick off the academic year. Read more about the Maverick Stampede. Parking alternatives are necessary because of the closing of Summit Avenue for resurfacing through Monday, Sept. 21. Cast stone repairs are underway in the College Park District. Traffic barriers are on Spaniolo Drive between First and Second streets through Friday, Sept. 25. The sidewalk east of the Dan Dipert University Welcome Center is closed to pedestrian traffic through Thursday, Oct. 22. To reach the Welcome Center, go through the parking garage and enter from the west. Grade exclusion and grade forgiveness requests can be made for fall term processing Tuesday, Sept. 15-Wednesday, Nov. 4. Contact your academic adviser for eligibility information. Historic artwork and hidden treasures are part of The Gallery at UTA’s opening exhibition for the 2015-16 school year. “Building: Selections from the University Art Collection” features works chosen from several art and artifact collections at UT Arlington. The exhibit illuminates some rare gems not widely seen by the general public. Media includes contemporary prints, photographs, and paintings; early- and mid-20th century prints by Ruscha, Picasso, Dali, Miro, Baskin and others; modern and contemporary glass works; as well as wood, ceramic, and bronze pieces. The exhibit opens Tuesday, Sept. 8, and runs through Oct. 10. Gallery hours are 10 a.m.-5 p.m. Mondays-Fridays and noon-5 p.m. Saturdays. The Gallery is located in Room 169 of the Fine Art Building. A reception for the exhibition is scheduled for 5:30 p.m. Friday, Sept. 18. Read more about Building: Selections from the University Art Collection. Afternoon Showcase Matt Cermanski, a contestant on season 5 of NBC’s vocal competition The Voice, performs. Free. 11 a.m.-2 p.m., Palo Duro Lounge, E.H. Hereford University Center. EXCEL Campus Activities. DUI Simulator Experience what it's like to drive under the influence. 10 a.m.-2 p.m., Palo Duro Lounge, E.H. Hereford University Center. Health Services. 40th Linton Powell Organ Recital Linton Powell, retired professor of music, performs for the 40th year with organ and harpsichord music. Free. 7:30 p.m., Irons Recital Hall, Fine Arts Building. Music. Friends of the Library Russell Gold discusses his book The Boom: How Fracking Ignited the American Energy Revolution and Changed the World. 7:30 p.m., sixth floor, Central Library. Friends of the Library. Discount Rangers Tickets Rangers vs. Oakland Athletics. Globe Life Park. Also, Saturday-Sunday, Sept. 12-13. Visit texasrangers.com/grouptickets, click on UT Arlington, and use the password GOMAVS to get your discounted tickets. Guest Double Bass Recital Milton Masciadri of the University of Georgia performs. Free. 7:30 p.m. Irons Recital Hall, Fine Arts Building. Music. Discount Rangers Tickets Rangers vs. Houston Astros. Globe Life Park. Also, Tuesday-Thursday, Sept. 15-17. Visit texasrangers.com/grouptickets, click on UT Arlington, and use the password GOMAVS to get your discounted tickets. One Mic Stand Comedy Show Free. 7:30-9 p.m., Rosebud Theatre, E.H. Hereford University Center. EXCEL Campus Activities. Free Music Recitals and Concerts Guest Piano Recital with Gustavo Romero, Saturday, Sept. 19; Voice Division Recital with UTA vocal students, noon-1 p.m., Monday, Sept. 21; Faculty Flute Recital with Terry Sanchez, Friday, Sept. 25; Honors Recital, noon, Monday, Sept. 28; and Faculty Piano Recital with Young-Hyun Cho, Tuesday, Sept. 29. All free, at 7:30 p.m. unless noted, Irons Recital Hall, Fine Arts Building. Music. Food for Thought Rodney Caffey, right, a USA Olympic sports performance coach and a personal trainer, discusses “Exercise Frequency and Intensity: Is the Bro-science Really Science?” Free. Noon-1 p.m., Room 213, Maverick Activities Center. Campus Recreation. M.S. in Health Care Administration Info Session Learn more about the accelerated, cohort-based program designed for professionals in the health care industry. Register online. 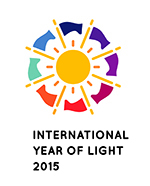 6 p.m., Universities Center at Dallas, 1901 Main St., Dallas. Business. Psychology Colloquium William B. Swann of UT Austin discusses “What Makes a Group Worth Dying For?” He is best known for the development of self-verification theory and identity negotiations theory. Noon, Room 10, University Hall. Psychology. UT Arlington Photonics Symposium For the International Year of Light, this daylong symposium includes presentations by faculty, a poster session, panel discussion, and a final reception. 7:30 a.m., Bluebonnet Ballroom, E.H. Hereford University Center. Engineering. Top performers: Junior Cassidy Wheeler, left, and senior Stacey Koch, top right, were named to the all-tournament team at the season-opening Maverick Classic at College Park Center. Bottom right, junior pitcher Joel Kuhnel was named the top prospect from the Jayhawk League by Baseball America and Perfect Game. UTA picked up a pair of victories Saturday in the final day of the Pioneer Classic in Denver, defeating Villanova in four sets before claiming a sweep of Air Force. On Friday, the Mavericks fell 3-2 to host Denver. 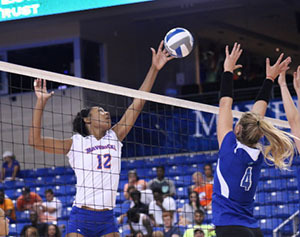 Senior Stacey Koch and freshman Zhanelle Geathers were named to the all-tournament team. Now 5-2 on the season, UTA returns to action at 6:30 p.m. today Tuesday, Sept. 8, against Abilene Christian at College Park Center. The men’s and women’s cross country teams began the year last week at the Bear Twilight Invitational in Waco. Just three athletes with previous experience for the Mavericks competed at the season-opening meet. UTA’s top men’s finishers were sophomore Michael Guerrero, junior Tyler Forde, and freshman Chris Myers. For the women, senior Ashly Wright and freshman Anamarija Petters paced the squad. The men are ranked sixth and the women 11th in the preseason Regional Team Rankings by the U.S. Track & Field and Cross Country Coaches Association. The Mavericks compete Saturday, Sept. 12, at the Ken Garland Invitational in Denton. • The men’s and women’s tennis teams kick off their fall schedule Friday, Sept. 11, at the Marco & Co. Catering Islanders Invitational in Corpus Christi. • Assistant golf coach Casey Devoll won the National Car Rental NTPGA Assistant Championship last week in Plano. He fired rounds of 67 and 66 to finish at 11-under par. • Junior pitcher Joel Kuhnel was named the top prospect from the Jayhawk League by Baseball America and Perfect Game. Upcoming intramural sports deadlines are foosball, today, Tuesday, Sept. 8; softball, Wednesday, Sept. 9; and racquetball, Friday, Sept. 11.